Toasted apple cornbread, melted butter, and hot ham. Sound ok to you? Apples stirred in to cornbread? Awesome! Why had I never heard of this before? I initially made the cornbread according to the historic recipe; it was very dry, grainy, and crumbly. Not pleasant. I prefer a cakier, modern cornbread. So I retronovated: I grabbed my favorite contemporary cornbread recipe (Mark Bittman’s) and folded in about a cup of chopped apples at the end. 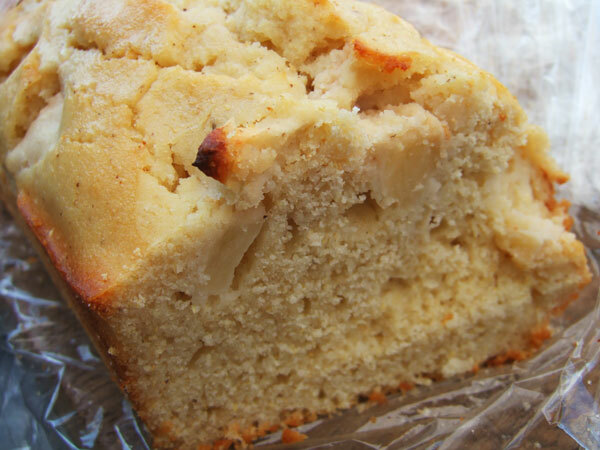 A cross section of cornbread and apples. Cornbread and ham were common foods served at fairs and political rallies in the 19th century, so it only made sense to pair my apple cornbread with a thick slice of ham. 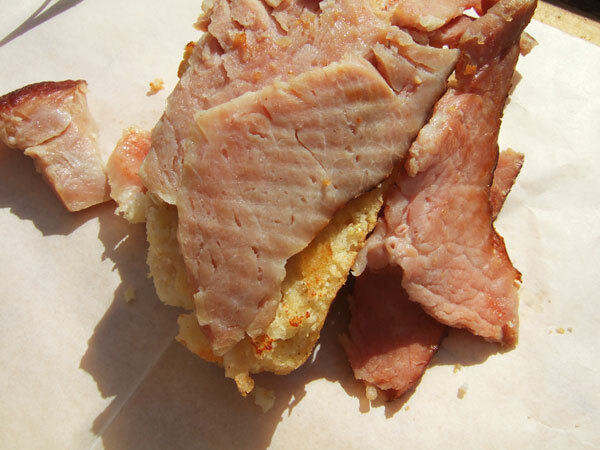 At the baseball game, I toasted the cornbread on a griddle and heated a slice of ham alongside. The cornbread got a healthy smear of fresh, handmade, sooo-yellow butter I got at Saxelby’s Cheese in the Essex Street Market. Seriously, one forgets how yellow fresh butter is. Anyway: cornbread, butter, and hot ham on top. It was a damn good sandwich. Ah well, the johnny cake was more like a corn toastie… flat and carriable… but dry and crumbly would be weird for that…were they supposed to dry out and get hard, I wonder??? Great idea though… apples and cornbread??? MMM and sticking ham into the mix…priceless. I might even watch a baseball game if I could eat one of those babies.